I live and paint in Southern Colorado, which claims the largest alpine valley in the world. 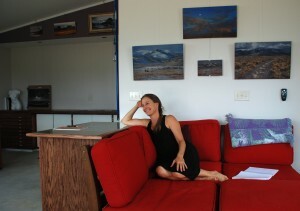 My studio is situated one mile from the upper Rio Grande, near the Continental Divide. The weather and landscape varies between extreme and sublime. Clouds shroud the Sangre de Cristo Mountains with luxurious austerity. New light cuts a strong angle across an expanse of chico bush. The terrain and temperature can be harsh, but alluring. It is both comforting and unnerving to me, this blessed but unforgiving geography. Dichotomies abound when immersed in nature, but it is the simultaneous peace and exuberance that I feel outdoors that drives me to paint. A constant performance of earth, sky and light offers me an endless variation of landscape. I am challenged to use as many mixtures of hue, texture, intensity, and value that I can create with oil paints. I often use a palette knife, and prefer a very firm blade, one that doesn’t bend and give way when I scrape it across the painting surface. It will skip over the weave of canvas which allows a Venetian Red gesso to vibrate through the layers of paint. This creates an effect similar to the clear, crisp, winter sun and the way it glistens on icy snowpack. Figure painting is a similar experience, with the human body as the land under a spirit sky, surrounded by an atmosphere of soul. The same artistic principles apply. Subjects and compositions are influenced by my surroundings, in my choice of mood, pose and lighting. My landscapes reflect a location that remains vast, underpopulated and lost in time as far as the wildlife is concerned. The ancient chortles of migrating Sandhill Cranes scatter around me as thousands fly over my studio. Farther afield, big game and predators continue their habits, unchanged for centuries. In a similar fashion, I am summoned to create in continuous, inevitable patterns. Each day dissolves into night. The sun gives over the sky to moon and stars. At sundown, there is one final nod of pinkish hues to be remembered on the clouds and captured in a painting.